Mirabella lead star Julia Barretto was rushed to the hospital on Wednesday afternoon. 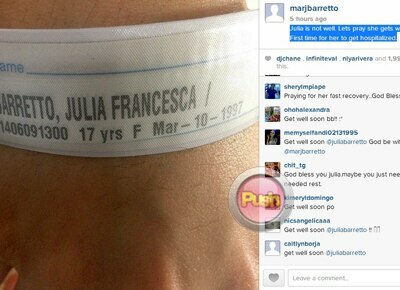 Julia’s mother Marjorie Barretto took to her Instagram account to announce the unfortunate incident by posting the young star’s patient hospital bracelet. “Julia is not well. Lets pray she gets well right away. First time for her to get hospitalized,” she wrote as the photo’s caption. The post has over 2,000 likes and 220 comments from fans expressing concern for the young Kapamilya star. Reports have it that Julia is suffering from a high fever.